Here is a list of best free script writing software for Windows. All these software can be used as script writing software and screenwriting software. These software let you create and organize stories, dialogues, scenes, etc. Script usually deals with dialogues and description of characters, while screenwriting is mainly focused on story and it tells how a story will go. Using these script writing software, you can easily describe scenes, dialogues, story, acts, etc. Some of these free script writing software let you focus only on writing, rather than editing your text. Like, you don’t have to type the name of characters again and again. These tools give you instant access to saved data, for the instances where repetition is required. Navigation options make it easy for you to navigate to different scenes. Some of these creative writing software help you write dialogues of different characters easily; you can easily switch between characters. My Favorite script writing software is TrelBy. It is one of the best script writing software. It supports multiple tabs which can be useful in many situations. It has a database for different names in various countries. So, it will help you to choose characters’ name wisely from its database. You can import, export, print, and save your work. You can also check out the list of Best Free Mobi Reader Software For Windows, Best Free Logo Maker Software For Windows, and Best Free Timeline Maker Software For Windows. TrelBy is a free screenwriting software. It supports multiple tabs and thus you can work with multiple scripts at a time. It displays instructions for keys on the top of the interface. It helps you insert characters, dialogues, scenes, actions, etc. instantaneously. This freeware lets you switch among different views: fullscreen, WYSIWYG, draft view, etc. It has a database of names which contains lists of names from various countries, which sums up to about 200,000 names. It can export scripts in Text, PDF, HTML, XML, RTF, Fountain, and ASCII. Import Text, .fadein, .astx, .fountain, .celtx, .fdx, etc. Compare two scripts easily with this freeware. It lets you save the scripts as PDF with watermarks. Watermarks can be customized as per your choice. You can also use spellcheck dictionary. Report menu lets you export reports on scenes, characters, dialogues, locations, and scripts of the story. Compatible Operating Systems: Windows and Linux. 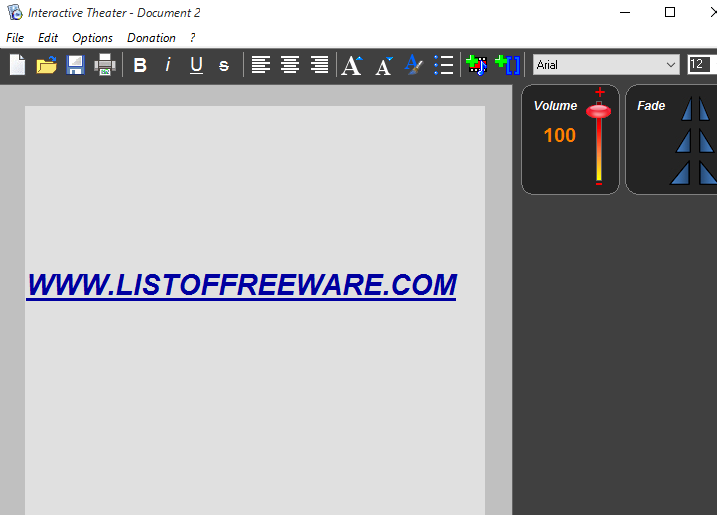 yWriter is another free script writing software. It is just like a word processing software with some advanced features. It lets you break or divide story into chapters and scenes. You can create chapters and add description to them. Add summary, short description, or full description to a chapter. Add characters to your story. You can also import and export documents in different formats, like: RTF, TEXT, YW5, HTML, etc. Set goals for chapters, scene, words, project etc. It let you specify the maximum number of words to type, number of scenes to create, number of chapters to write, etc. Supported Platforms: Windows, Linux, and Mac OSx. Page2Stage is a freeware specially designed for writing scripts, plays, and screenwriting. It is a free novel writing software, screenwriter software, story writing software, etc. Go to File>New option to create new screenplay, sitcom, play, etc. It supports multiple tabs which can be set as cascade view, tab view, tile view, etc. This script writing software incorporate options to insert Act, Scene, Action, Dialogue, Notes, etc. You can use different formats for scenes, dialogues, action, characters, parenthesis, paragraph, etc. This will help you to differentiate all these entries. Finally, save your screenplay as .sws, .rtf, etc., files. You can also use various tools like Spell Check, Thesaurus, Auto cheat, Cheat, etc. Amazon Writer is a free app for Chrome. It is dedicated for writing scripts. It is compatible with many devices and supports many elements. It lets you insert screenwriting, Scene Heading, Action, Characters, Dialogues, etc. You can specify your play script under these categories. These will help you to recognize sections easily. You can save your work in draft or to cloud. Export your document as fountain, pdf, and fdx. You can also share your scripts with your friends via email. Note: It encrypts the scripts before saving it to the cloud. 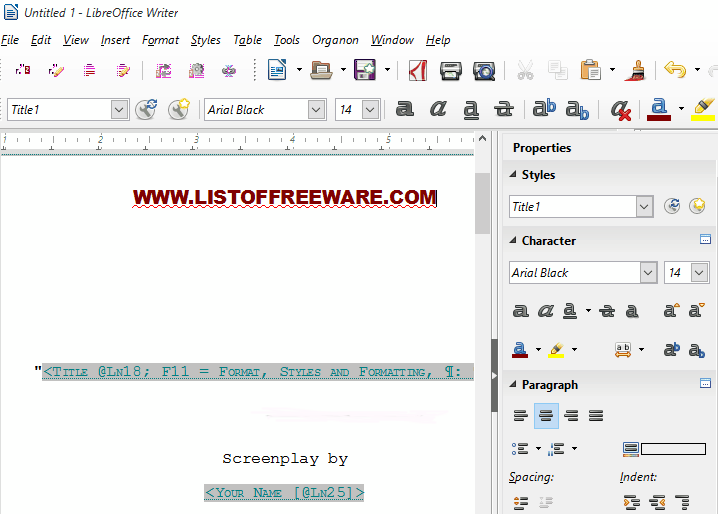 ScreenWriter is a freeware to write or create scripts of the movies, TV serial, books stories, etc. It is very easy to use and lets you create stories or scripts without hassle. You can add different dialogues; you just have to click on an icon which lets you easily add different names of different characters with their dialogues. Similarly, you can add location as well for a scene. As you add a name or location, it will automatically save it to the database and they can be viewed on the right side of the interface. Next time you can use these items instantly. You can export your work as Rich text file, HTML file, or Text file. Save your documents as .swe. Quoll Writer is a free writer software. You can use it to write scripts with lots of formatting options. You can create various chapters and write under them. You can even create multiple chapters in separate tabs. You can add information about a chapter like plan, goals, description, etc. This script writing software has a full-screen mode called non-distracting mode. Here you can easily write with any distraction. You will find only a workspace to write. Options will appear when you hover mouse cursor on the left and top of the interface. You can create projects, rename projects, add images, add graphs, import projects, export projects, etc. LibreOffice Writer is one of the best writing software, and it can be used as script writing software as well. There is an extension available which adds the features of script writing in LibreOffice Writer. Download extension for script writing and write you story or script. This will help you to add different scenes, dialogues, and actions separately. It is basically a template, which you can use to write scripts or stories. You can easily edit it and add your own contents. As LibreOffice Writer is a word processor, you can easily edit documents as per your need. LibreOffice Writer comes as a part of LibreOffice Suite and is available for multiple platforms, like Windows, Linux, and OS X.
OpenOffice Writer is also a word processor, which comes integrated with OpenOffice Suite. You can use it for script writing after installation of an extension, just like LibreOffice Writer. This extension enhance the writer’s features and enables it for script writing or screenwriting. Use the extensions for script writing and create scripts with a word processor. RoughDraft is another free screenwriting software as well as script writing software. It supports multiple tabs so you can write multiple stories at a time. You can simply write a story, save, and print. There are many types of useful tools available, like: Word Counter, Spell Check, Dictionary, Calculator, Make AutoWord, Live Spellcheck, HTML Publish, etc. You can use different styles for heading, subheading, text body, etc. Save output file as .txt, ad .rtf. CreaWriter is another good script writing software. This script writing software lets you create scripts with lovely background and interface. It provides a distraction free environment for script writing with no options being displayed on the interface apart from the workspace. To view options, hover your mouse to right and left sides of the interface. These options include text formatting options and options to save or create new document. There is an option for Ambient sound, which is configurable. Font size and type can be changed. Note: It is not totally free, some formatting features are disabled in the free version. 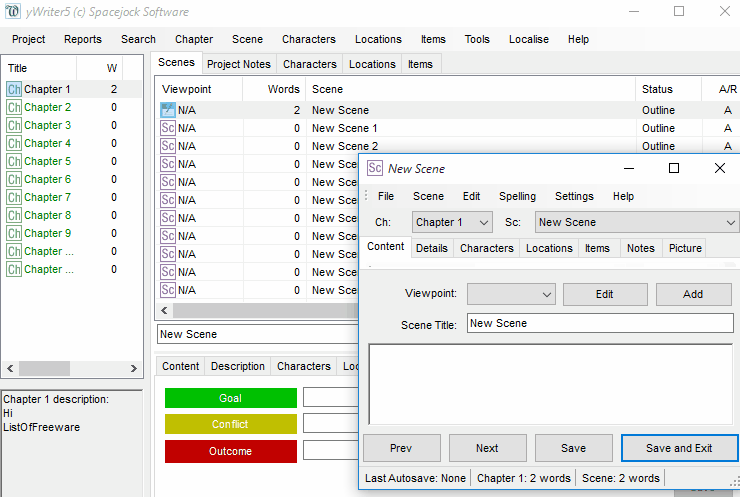 AkelPad is a free cross-platform software for scriptwriters. It is available for Windows, Mac, and Linux. It can save files in various different types of codepages. You can work with this freeware in multiple tabs. Adjust these tabs in Cascade, tile horizontal, or tile vertical. It is designed to be easy to use and be fast. Supports various Plugins for syntax highlighting, folding, auto-completion, scripts execution, and keyboard macros. Compatible Windows Versions: Windows 10, Windows 8, Windows 7, Windows XP, Windows Vista, Windows NT, Windows 2000, and Windows 2003. Interactive Theater, as the name suggests, is an interactive screenwriter software with lots of features. Use it to create script for plays, acts, movies, TV serials, etc. Various text formatting options to add and change font, color of font, list, tables, etc. are available. It lets you create script and let it interact with with animation, audio, video, or pictures within the program. The multimedia files can be edited with various effects, like: fade in, pause, stop, change volume, etc. These can be done with the help of handy buttons available. Option to show video containing script, directly via projector is also available. It is an interactive platform to present your script with images, audio, and video. Compatible Windows Versions: Windows 10, Windows 8, Windows 7, Windows XP, and Windows Vista. AbiWord is a free creative writing software. It can be used for script writing as well. You can write stories, scenes, and dialogues easily. As it doesn’t have any template for script writing, you have to add formatting manually. I chose to include this writer, as it has rich text formatting options. Add Headings, titles, paragraphs, tables, matrix, and much more. This script writing software is Cross platform, and available for Windows and Linux. WriteMonkey is like word processing programs which helps you to write scripts or any thoughts without any distraction. It opens a separate window for writing. You have to quit this program to use other programs. It provides a distraction free environment, where you cannot switch to other programs or tabs. 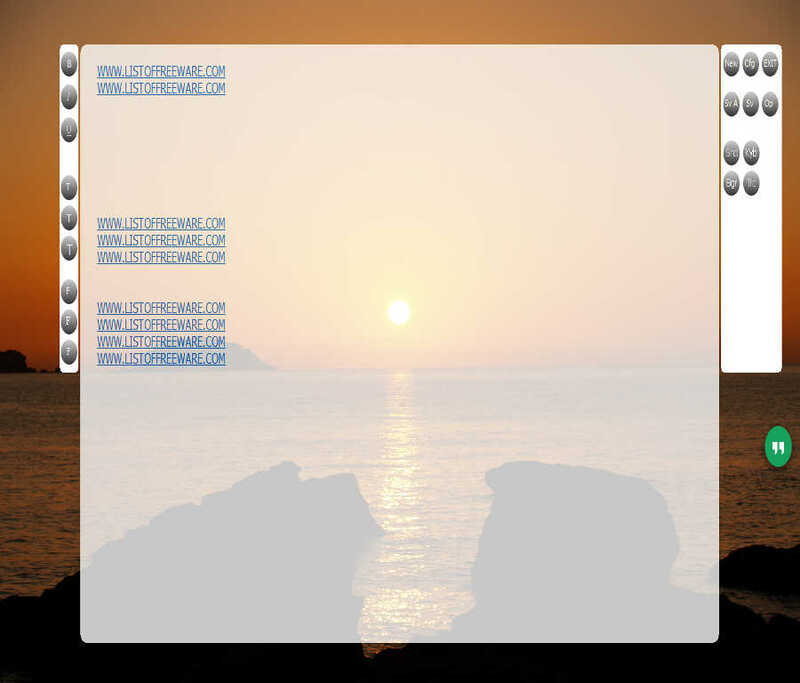 This script writing software has a clean interface with a nice background. You will find formatting options in right-click context menu. SCRATCH options lets you apply filter for Files, Folders, Headings, and Bookmarks. FocusWriter is a simple and one of the best screenwriting software. It lets you focus on writing rather than other jobs by hiding its options. Normally it has a clean interface with writing section only. Toolbar can be made visible by hovering the mouse on the top portion of the interface. Change font style, color, size, etc. It supports TXT, ODT and RTF files. Other tools let you change themes according to your choice, set timer for writing, set alarm, manage daily progress, and sessions. This script writing software is cross platform, available for Windows, Linux, and Mac. SSuite QTWriter is a free writing tool to create and edit various types of documents. 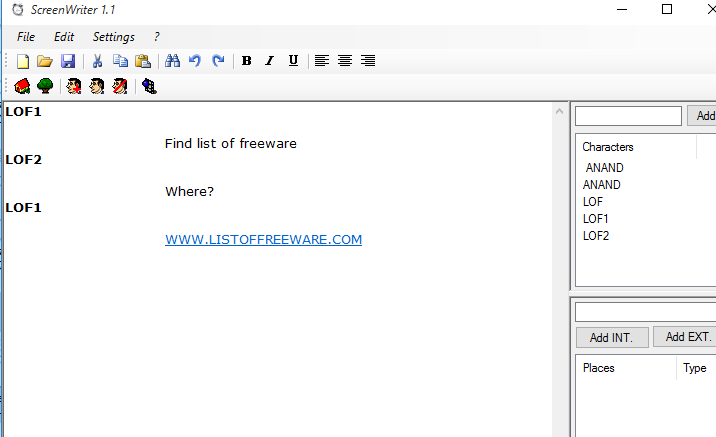 You can also use this freeware as script writer. You can use different font styles, adjust line spacing, change background colors, font color, etc. Embed illustrations, tables of contents, indexes, and other formatting. Save, print, and share your creation. Save a document as .txt, .pdf, .rtf, .doc, .rtc, and .ssp. SSuite Writer’s D’Lite is a writer’s tool. It is not totally dedicated to script writing, although can be used as script writing software. It lets you create scripts by adding heading, paragraph, title, etc. Change fonts, font sizes, font colors, line spacing, various background colors, etc. Export your document as PDF, RTF, DOC, SSP, TXT, etc. Save option is also available in all of these formats. You can also preview your creation. This script writing software is available for Windows, LINUX, and Mac.